Making the most of days due off work I had put in for Monday as it was looking bright. What I hadn’t known was that there would be a stormy day beforehand dropping and moving enough snow around the mountain to freshen things up. There was cloud, but it was high and sunny spells were frequent although not persistent. I was about third or fourth on the lift and keen to hit the fresh snow that was plain to see on the upper mountain. Mid mountain is still there, but with quite a few scoured patched. The uptrack is still good but the main plateau run has a grassy break half way down. The Wall T-bar wasn’t running, so I jumped on to the Cliffhanger chair straight away, then up to Main Basin. It had a set of tracks in it already and there was a skier ahead of me on the Summit T-bar. There was plenty to go round though. At least for the first hour or so! The snow was wind packed powder. Not massively deep, but a pleasure to ride. Smooth creamy turns were had and I did two or three laps of the main basin before continuing onto the Wall, where the soft snow continued on the leeward slopes. Hopping on to the Cliffy and on to the top, I made my way across to the Spring Run. I was hoping it had softened up, but the top part was solid. My board grating across the fall line before picking out the more frequent soft spots that grew as I descended. From about halfway down, the snow changed and the wind packed snow returned. Nice turns all the way down until it re-joins Mugs Alley. The snow here was starting to break down, becoming slushy in parts and heavy traffic spots becoming a tad brown. I did try Happy Valley but already it was rutted with a bit of ice in between. I had a few more laps of Main Basin & Ski Tow Gulley before stopping for a bite to eat. I tried Happy Valley after lunch and it had changed completely. It had turned to spring snow and smoothed out. I could hear the slushy snow landing behind me as I turned my way down and back to the lift. I decided to try out Spring Run again to see if the snow there had changed. It had. From the top to the bottom smith turn in lovely spring snow. Main Basin had started out perfect, but was now getting pretty cut up. Almost at the mogul stage, but not quite. I sought out some smooth areas on the other side of the lift and returning via ski tow gulley once again. I met up with Frank who had returned to the hill after lunch and he suggested trying out the Flypaper. It hadn’t been open all season so we went over to check it out. It shouldn’t be icy and the snow is softening up nicely I thought as we trekked across the summit to the top of Flypaper. Because the snow was stripped off most ridges including the top of the East Ridge and Flypaper, we had to walk to the edge. 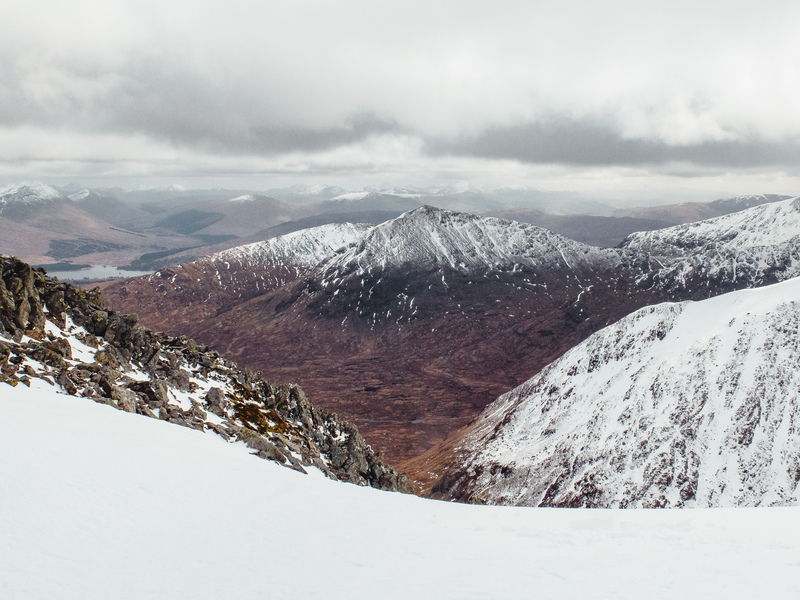 It had been a while since I last went down Glencoe’s infamous black run and it had changed so much with this snow pack. Sliding over the edge, you can’t see below you so I was a bit unsure which line to take being the first time this year. We cut across to the right before finding the entrance to Baillie’s Gully which had lovely turns leading into Radio Gully (According to Chris), then cutting under the Flypaper itself. It was almost 4 o’clock and we aimed for the Cliffhanger chair to return to the summit. As we walked from the Cliffy to the summit T-bar, the liftt signalled that it was close. So that was it. A full day, and a great day. The snow was amazing and it’ll be spring conditions most days from now. Maybe time to start snow dancing once again to get this hill topped up with the white stuff.